Do you like a fun photo challenge? Try taking a photo of a dragonfly as it zooms on by you. Here’s an image I captured on Tuesday of a Common Baskettail dragonfly (Epitheca cynosura) in flight at Patuxent Research Refuge in Laurel, Maryland. In case you are curious, Common Baskettails are about 1.6 inches in length (41 mm). So how would you go about getting a shot like this? I would say that the key requirements are patience and persistence. 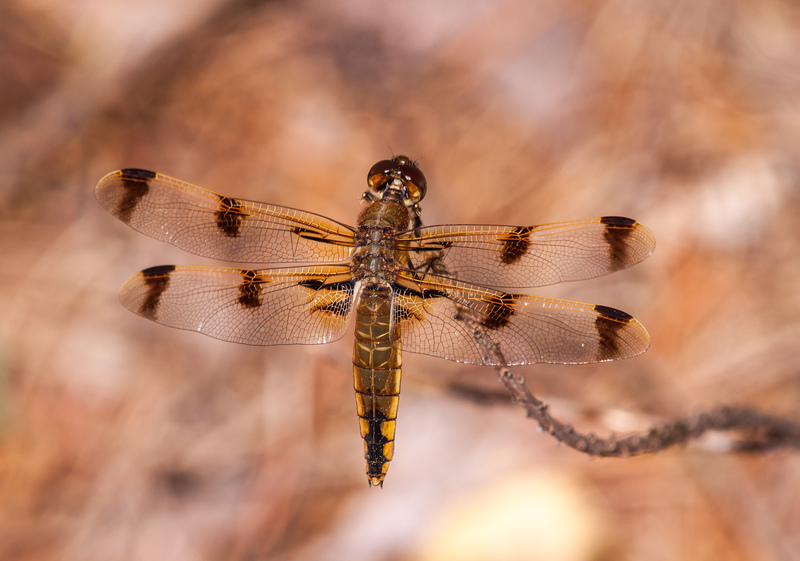 The first thing that I usually do is observe the dragonfly’s flight path and try to determine if there are particular places where it tends to hover or turn around. This particular dragonfly was flying low and not too far from the shore of a small pond. Focusing is the biggest problem. Some photographers like to pre-focus on an area and wait for the dragonfly to fly into that area. Others will rely on the auto-focus capabilities of their cameras. I have had almost no success with those techniques. What I usually do is put my camera’s focus into manual mode and literally change focus on the fly as I attempt to track the dragonfly in the air. I like to use my Tamron 180 mm macro lens, because it gives me a decent amount of reach and frees me from worrying about zooming in and out. 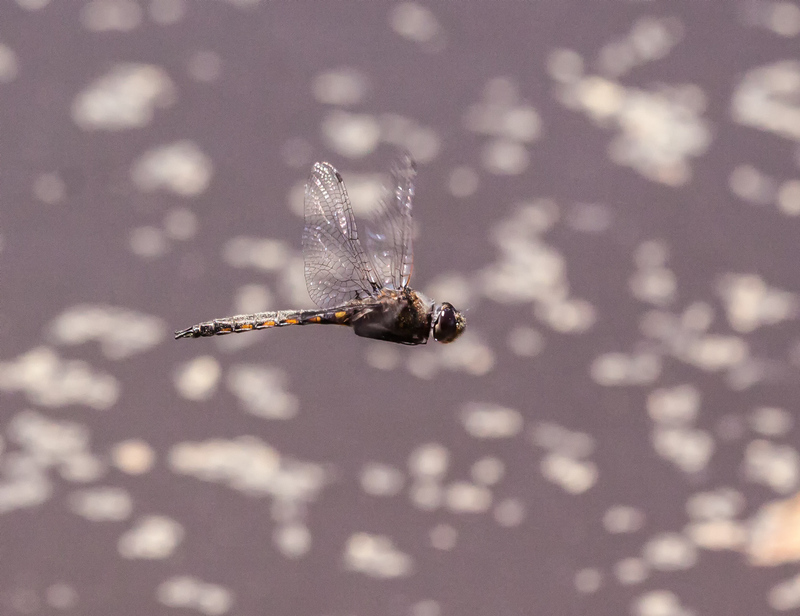 I have found that simultaneously zooming and focusing manually while tracking the dragonfly is like patting your head and rubbing your stomach at the same time—it is theoretically possible but tough to accomplish in real life. If you click on the image and view it in a larger size, you will see that I was fortunate to get my focus just about right for the middle of the dragonfly’s body. 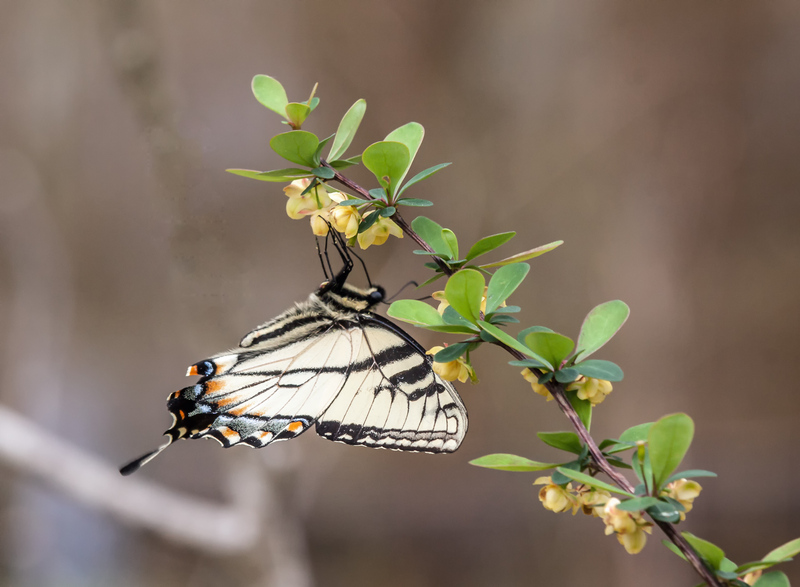 The shutter speed of 1/1000 of a second was fast enough to freeze most of the movement of the wings. Needless to say, I took a lot of shots and my success rate was very low. Perhaps this is not your idea of a “fun” challenge. In that case, I would encourage you to find some area of your life and challenge yourself to do something that is difficult. Even if you are not successful, I think even the effort will help you to grow, especially in self-knowledge and self-awareness. 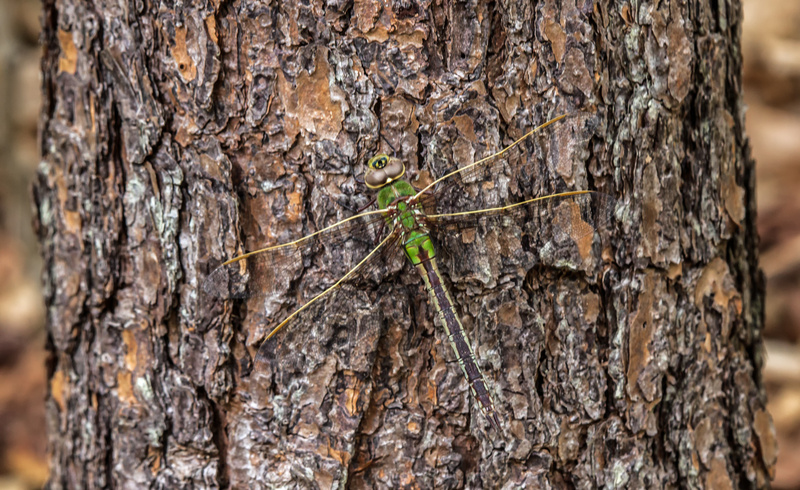 Odonata is an order of insects that includes dragonflies and damselflies. 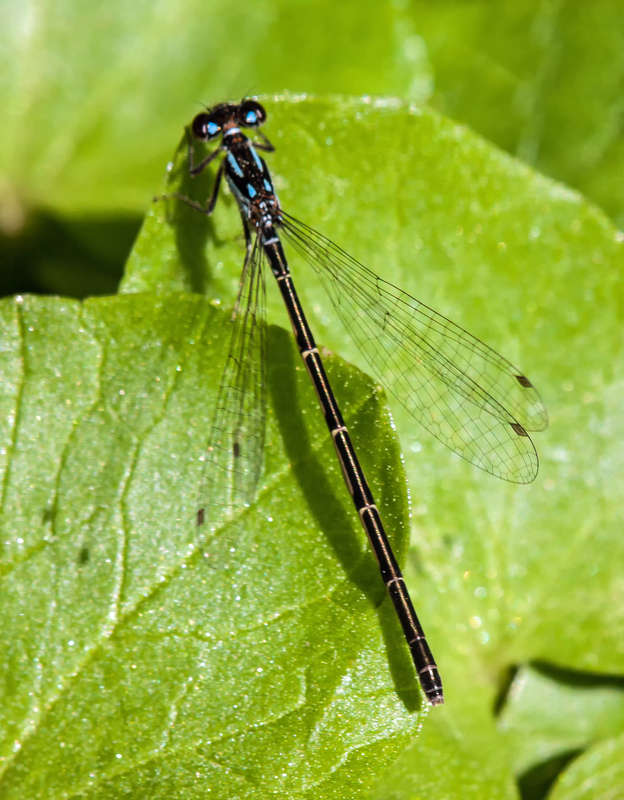 In general, dragonflies tend to be larger and perch with their wings held out to the sides, while damselflies are smaller, have more slender bodies, and most hold their wings over the body at rest. 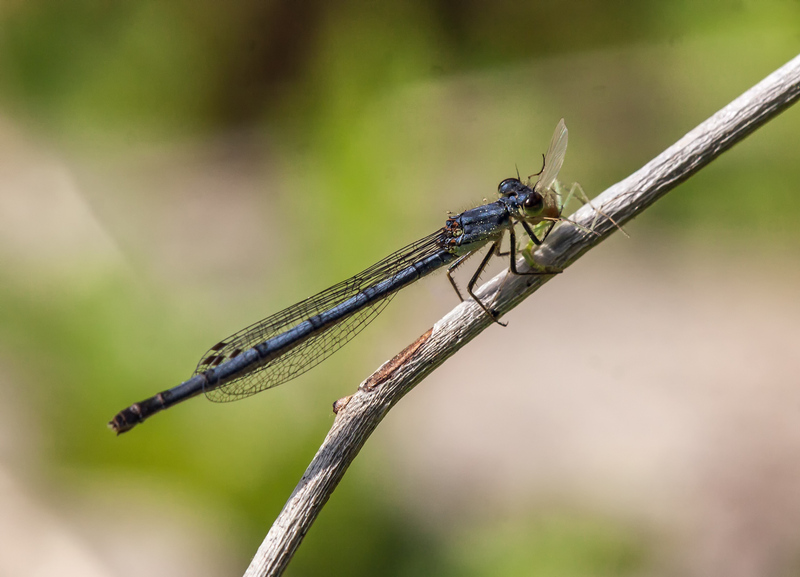 I try to pay attention to members of both damselflies and dragonflies, but often spend more time with the latter group, because they are easier to find and photograph. In the interest of equality, I decided to devote today’s post to some of the female Fragile Forktail damselflies (Ischnura posita) that I have observed this past week. The three images show female Fragile Forktails in three of their main activities—perching, eating, and ovipositing (laying eggs). I have no recent shots of the mating that precedes the ovipositing, so I will leave that to your imagination for now. As you probably noted, the coloration of these lady damselflies varies. The damselfly in the first image with the distinctive markings is an immature female. As the females age, they acquire a bluish coating that is sometimes referred to as pruinescence, which you can especially see in the second image. 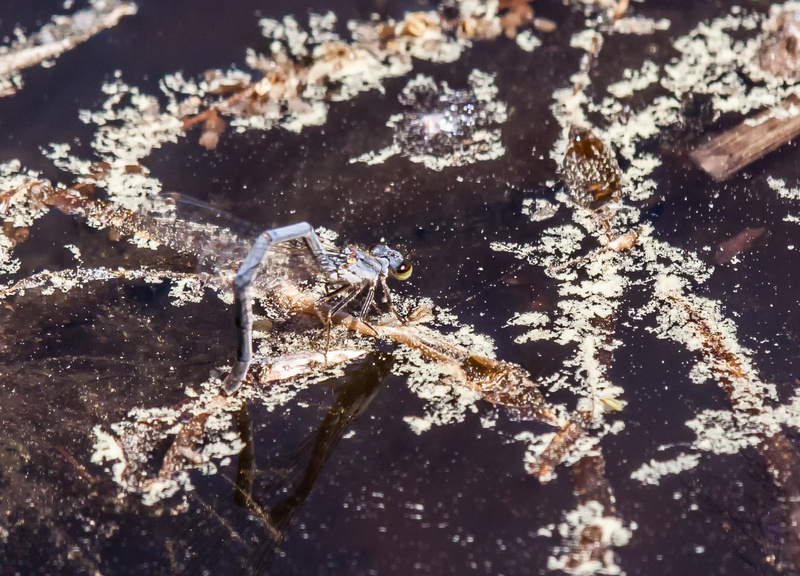 The third image shows a damselfly arching her long abdomen as she deposits eggs in the debris floating on the surface of a small pond. Sometimes I can identify a dragonfly by the way that it perches. Some dragonflies like to perch high on the tip of vegetation and some perch low to the ground or even on the ground itself. Some will hang vertically or perch horizontally or at an angle somewhere in between. 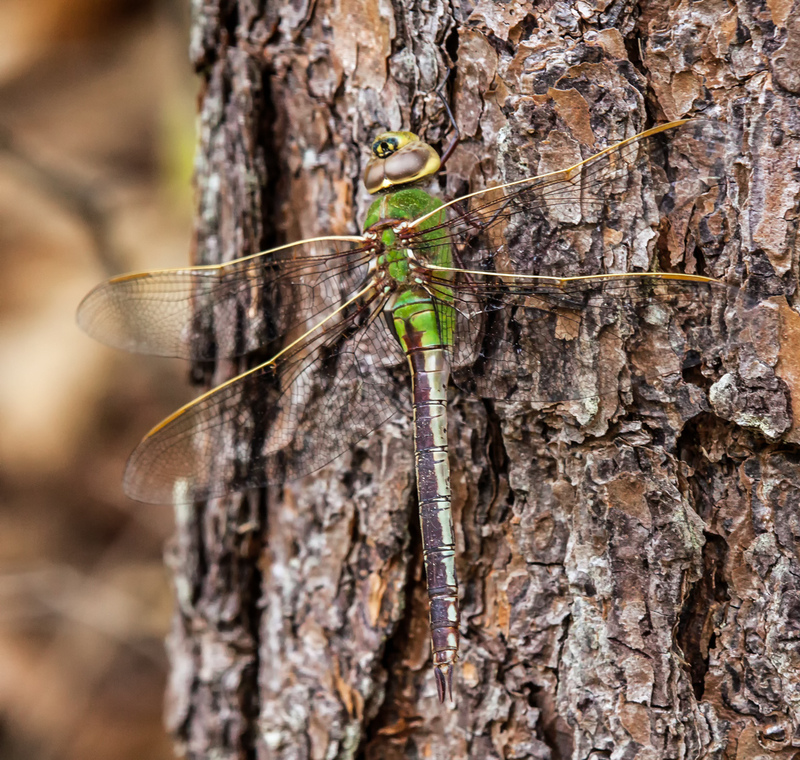 On the rare occasions in the past when I have seen a Common Green Darner (Anax junius) perch (usually I see them in the air), it has usually been in vegetation relatively low to the ground. I was therefore surprised to see one spreadeagled on the side of a tree on Monday at Patuxent Research Refuge in Laurel, Maryland. Of course, the bright green color and the bull’s-eye patter on the face made it easy to identify this dragonfly, despite her unconventional perching pattern. I have learned from experience that the wildlife subjects that I love to photograph often do not look or act the way in the ways described in books. They are may also be found in different habitats or at different times than the range maps indicate. That is what makes this type of photography so challenging and so rewarding and it means I have to be constantly alert and vigilant when out in the field. What is your first thought when you see these three turtles together? Are they just friends or more than friends? 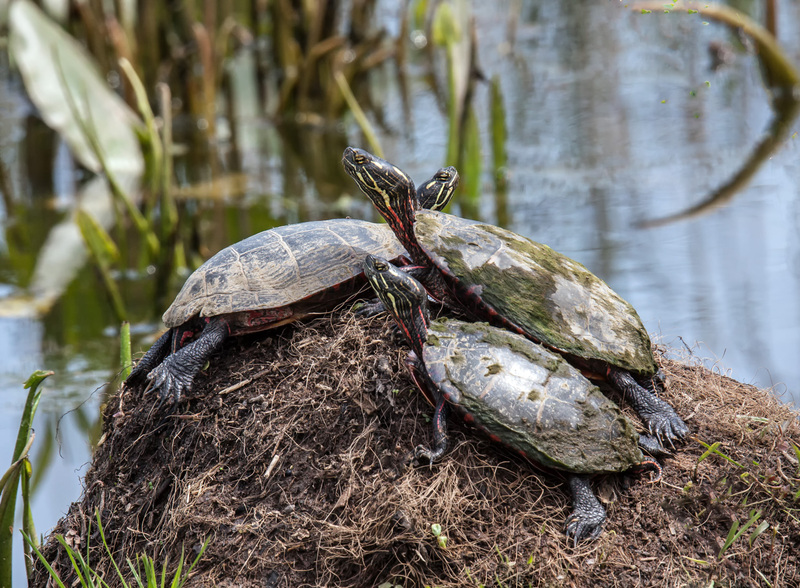 The turtles seem to be pretty comfortable sharing a confined space and there is plenty of space in our minds for varied interpretations on the nature of their relationship. According to the old saying, “two’s a couple and three’s a crowd”—is that always true? Whatever the case, the turtles at Occoquan Bay National Wildlife Refuge have been definitely been enjoying our recent sunny days. My turtle identification skills are not very good, but I think these all may be Eastern Painted Turtles (Chrysemys picta picta), though there is a chance that they might be Red-eared Sliders (Trachemys scripta elegans). I love images like this one that allow viewers to use their creativity to interpret what they see and to generate in their minds their own mini-narrative of what is going on. Ménage à trois or just friends—you make the call. 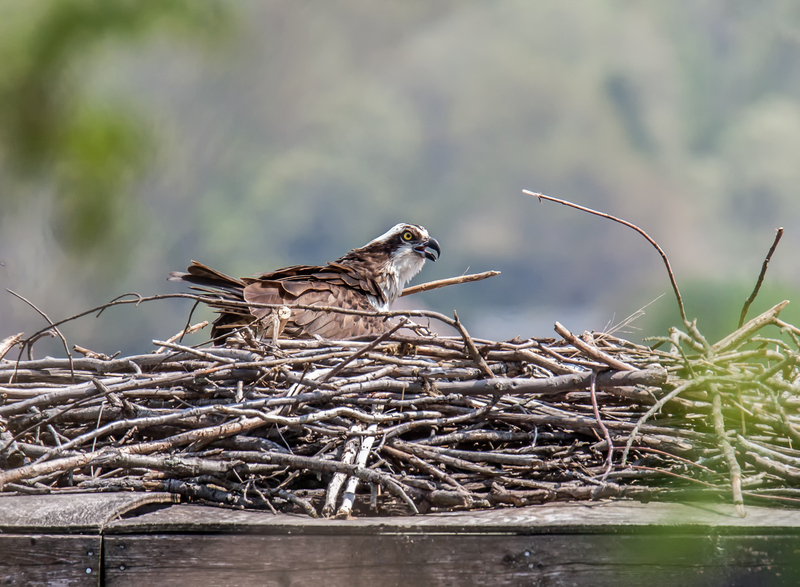 When it comes to choosing a nesting site, Ospreys (Pandion haliaetus) at Occoquan Bay National Wildlife Refuge seem to be opportunistic. 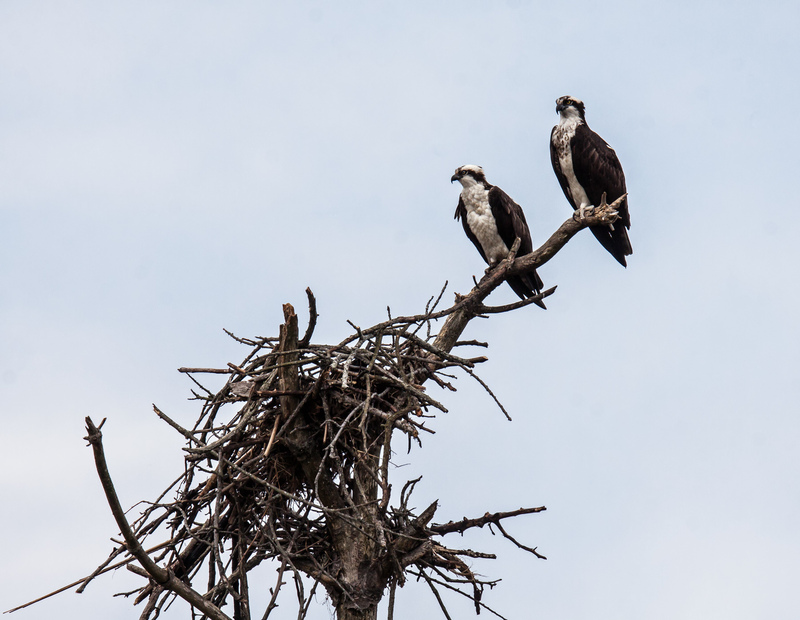 Some lucky couples are able to snag pre-existing nesting sites that require only minor improvements, while others are forced to build entirely new nests. This past Thursday I photographed a nest that is annually built on top of one of the duck hunting blinds in the waters off of the wildlife refuge. Earlier in the season, the ospreys would fly away as I walked by on a trail, but now that the trees are leafing out, the ospreys have a bit more privacy. The nest in the second image is a new nest, built in the last couple of weeks and probably still under construction. It is adjacent to the location where the nest in the third shot used to be. 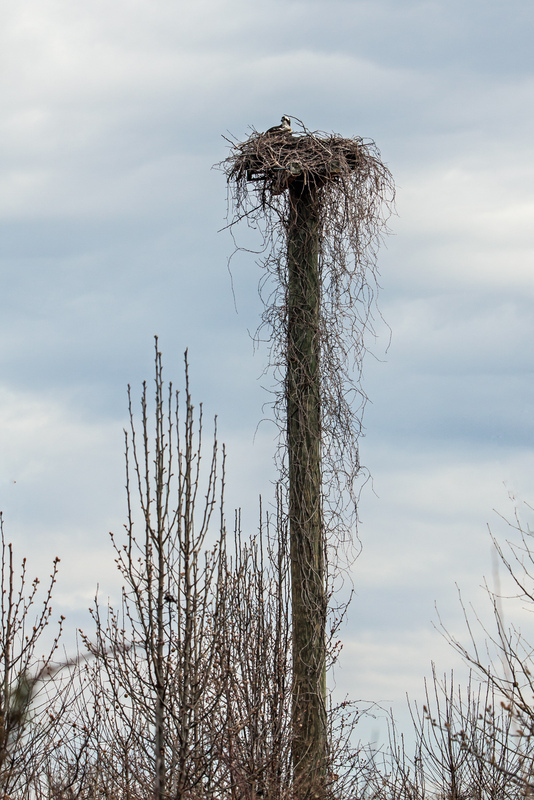 For reasons that are not clear to me, that nesting platform has disappeared and only a part of the post remains. I believe that the new nest may have been built by the couple that occupied that nesting platform earlier in the season.